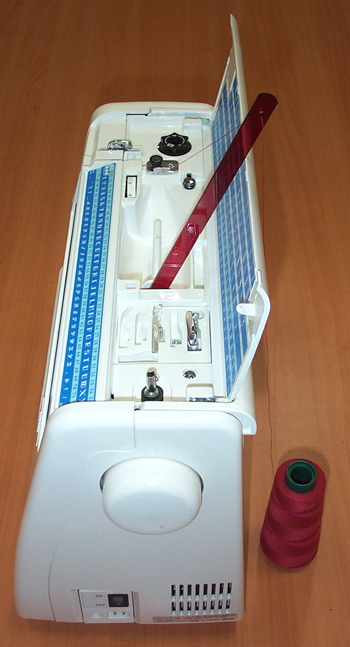 Want to use larger spools or cones of thread on your home sewing machine, but the spool pin on your machine won't accommodate such spools? 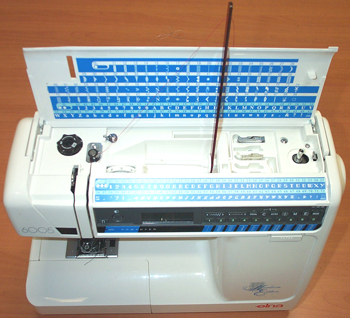 The Thread Stem is the simple, cost-effective solution. For years there have been thread stands, but they take up additional table space, are not portable for travel, and typically cost $10 - $20. The Thread Stem is simple to use (no assembly required! ): just insert it onto your machine's spool pin (see pictures at left) and put your thread through the hole at the other end. Its small size means you can take it with you anywhere, so even if you already own a thread stand, take The Thread Stem with you to class, on a trip, or wherever you go to sew. 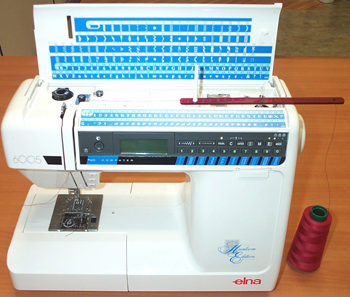 It works on virtually all sewing and embroidery machines and its highly visible red color means you won't lose it! And, as an added bonus, you can use it to push corners out when making a purse, bag or pillow case! To learn more about how this tool works, read our simple instructions or click on the button below to watch a short video.